It is hard to believe that November has come and gone and December is here! With the Thanksgiving holiday, many of us spend extra time counting our blessings and reflecting on the many things we are grateful for in our lives. As I have spent time in prayer and reflection over my own life this past year as well as looking forward to adventures to come in 2019, I have found myself thinking a lot about God’s plan for my life, how He wants me to serve others, how He wants me to love others, and how through His will I can leave a small impact on this world. Edna Ferry, who passed away in October. This is Mark’s grandmother holding his dad, Mike. She was truly one of the most beautiful ladies I have ever known. At her funeral service, Mark’s dad shared about his Mom and the description of a worthy woman from Proverbs 31. I wanted to share Mike’s words with you. For clarity’s sake, Carla is Mike’s sister. “For as long as I can remember, I have been in awe of Mom’s strength, character, dignity and the other attributes that she displayed. I suppose that by the world’s standards, she was not remarkable. She was not highly educated, never had a lot of money and certainly never sought fame or power. But, I never saw her complain or bemoan what she did not have. She was one of the most positive people I have ever known and she always seemed to me to be completely comfortable with who she was. She was content to be a farm wife, homemaker, mother, grandmother and all the other roles that she took on and she did them so well. Carla says that she thinks being a mother was the biggest part of how she saw herself as that is what she wanted on her tombstone: a woman holding the hand of a little boy and little girl. (10) Who can find a virtuous and capable wife? She is more precious than rubies. (11) Her husband can trust her, and she will greatly enrich his life. (15) She gets up before dawn to prepare breakfast for her household. (17) She is energetic and strong, a hard worker. Her youngest grandson, Travis particularly remembers those breakfasts she prepared as being special. In fact, one of the favorite memories of all the grandchildren is breakfast at Mammaw’s. Mom was a very hard worker. For more than 35 years, they milked cows. Mom would get up at 4 AM go milk, then prepare breakfast. Throughout the day she took care of everything else around the house, Then in the afternoon, she would go back to the barn and milk again. Then back to the house to fix supper. For 35 years, she did that every day, seven days a week with never a vacation or break. The only times she missed was a couple of times when she suffered a broken bone and couldn’t help. Remarkable. Carla remembers that she was in college the first time Mom broke her arm. It was around Christmas and she came home. She and Dad together took on the task of doing what Mom usually did. According to her that proved to be an impossible task. She said that she and Dad would often laugh about their joint effort to make gravy and how they enjoyed every slice. When Mom and Dad sold the farm and moved to town, they continued to get up early and walk. We came to visit and Mom was telling me that they walked every morning. Then she said “Of course, we won’t walk while you all are here.” I asked her what time they walked and she said “we meet Mary Nell Graham down at her house at ten til five each morning.” I quickly told her that they could go ahead and walk and it would not interfere with our visit in the least. (20) She extends a helping hand to the poor and opens her arms to the needy. Mom did a lot of things for a lot of people. There was her aunt, Ollie Beauchamp, both my grandmothers, and Aunt Virgie Wilson. As all of those reached the point in their lives that they needed help, Mom was there to help see to those needs. Grandson Christopher said when he thinks of Mammaw he remembers her sitting at Granny Beauchamps side at the nursing home. She was so committed to caring for Granny. In addition, she kept in touch with a lot of people by phone. She checked on them regularly, making sure they were doing ok. I used to tease her some times when the phone would ring and she would begin to talk. Often, I could tell who she was talking to by the tone of her voice. She would unconsciously take on some of their speech patterns. For most all of my adult life, I have lived a long way off. Mom was a faithful letter writer and a very good letter writer. Her letters were filled with news and kept us up to date on what was going on in their lives. When the granddaughters left home, she did not forget them and wrote letters to them. Where she found the time, I don’t know, but her love and concern for people was wonderfully demonstrated by her actions. Ruth mentioned how she accepted people into her world whether it be into the family or new neighbors or wherever. She showed her love. (26) When she speaks, her words are wise, and she gives instructions with kindness. (27) She carefully watches everything in her household and suffers nothing from laziness. It was a very rare thing to hear Mom say anything bad about anyone and if she felt it necessary she was extremely uncomfortable doing it. Gentleness and kindness were such a strong part of her makeup. Anne: I cannot think of a better example of a person who showed the fruits of the Spirit (love, joy, peace, patience, kindness, goodness, faithfulness, gentleness, and self-control) in her daily living, her demeanor, her relationships, and every word I ever heard her speak. She was an amazing woman. Over the years as a mother myself, I have prayed for and sought ways to achieve the fruit of gentleness. I’ve always hoped my kids would look back on their raising and remember me as a gentle mother. 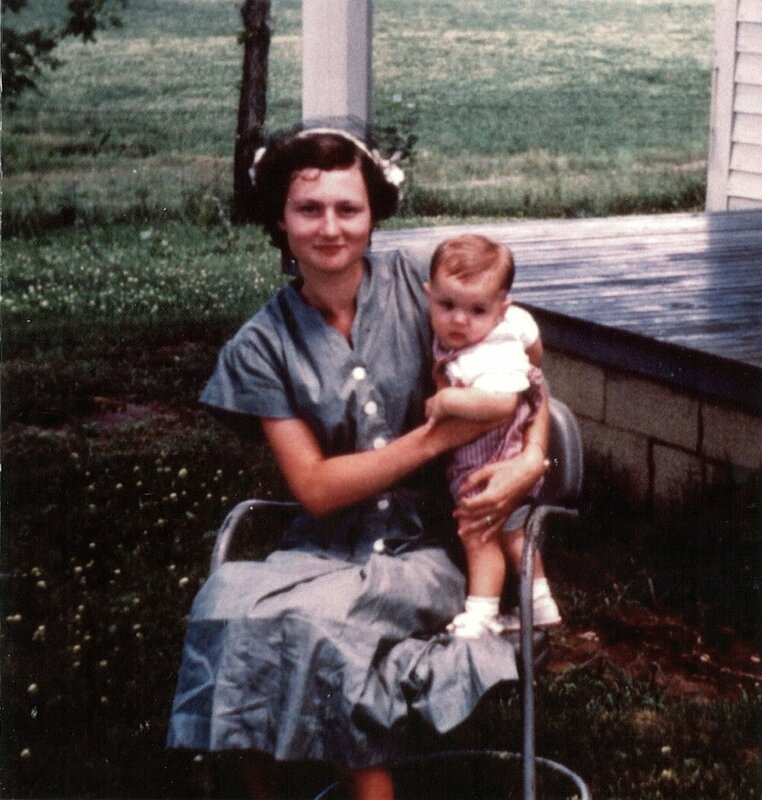 Though I have not achieved that myself, I can confidently say that is a legacy left by Mammaw, a gentle mother and grandmother, an excellent role model for me. I especially love the verse “Let your gentleness be evident to all. The Lord is near.” Philippians 4:5. 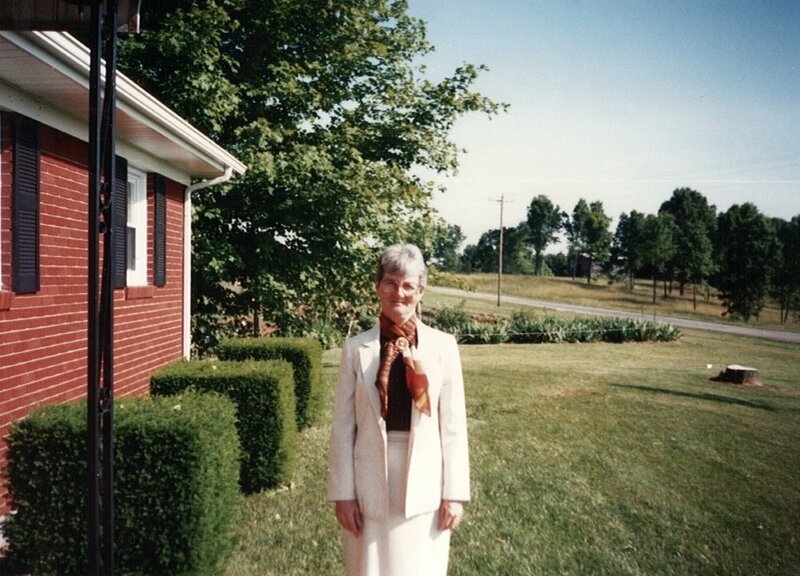 Mammaw’s gentleness was evident to us all, as she clearly walked closely with our Lord. There is a bit of irony in Anne’s mention of the fruits of the Spirit. If I was at home, I would be teaching a Sunday School lesson tomorrow from Galatians 5 which contains the teaching about the fruits of the Spirit. I agree with Anne that Mom’s life showed the fruits of the Spirit and is a strong affirmation of her faith. (28) Her children stand and bless her. Thoughts from the children and grandchildren. Carla: It seemed to me Mom always knew what to say in any situation, good times or bad. In our family, it’s a good thing she did. I remember her always helping people out in any way she could. Amongst our musical family, Mom was completely tone deaf. But, when we were little, I remember her singing hymns at home when no one else was around. She knew all the words but there was no recognizable tune! Everything I know about cooking Mom taught me. Some things I never mastered, like the yeast rolls she would let rise behind the coal stove in the winter or the jam cake with brown sugar icing. I have loved her, looked up to her, been supported and guided by her all my life. Mark: What always stands out to me is that I never heard her say a single unkind thing about or to anyone. I never heard her raise her voice or even show any kind of frustration towards anyone. She always sought out what she could do to make someone else happy. She was as selfless a person as I have ever known. When I read what Mark said about her never raising her voice or even showing any frustration, I was prepared to share that I had managed to provoke Mom’s wrath on a number of occasions. However, Christopher shared a story that topped anything I had to offer in that realm. He said: For many years , I viewed Grandad’s job as a dairy farmer as one of the toughest jobs I knew of. The physical labor aspect, the time commitment, the zero days of vacation. But as I’ve grown older, I realize the toughest job may actually be the wife of a dairy farmer. Not only do you share the responsibilities of farming, but you are also the caregiver of the family, the doctor, the chef, and in the case of Mammaw, the disciplinarian. Grandad would never lay a finger on me. The same could not be said for Mammaw. I’ve been spanked with a switch one time in my life and Mammaw has the honor of being on the safe end of that spanking. I believe I was about 9 years old. Mammaw and I were outside the house. I’m not sure what happened, but if I were to guess, I would say she was making me help her with something that I really didn’t want to help with. Things escalated and I ended up cussing at Mammaw. I immediately regretted that decision. In one motion, Mammaw snatched me up with her left hand, broke off a switch with her right, and wore me out. Looking back on it, it was a pretty impressive athletic move on her part. Needless to say, I never did that again. Karen: I had the same thought as both Mark and Anne. Gentle. Even if she was asking us not to do something, she was always gentle. I naively did not think much about it as a kid, but I am amazed now at her strength/endurance/dependability(not sure I can find the perfect word I am looking for), but who works that many years with no days off? So diligent, every morning starting at 4 AM. It is remarkable. I admire how she served us all, but especially watching her take care of granddad.When they got concerned about their health, they changed their lifestyle… the way she cooked and those walks every morning in retirement.She set her mind to something and that was that.I remember once Grandad getting emotional when trying to tell us a story and she saw it and just picked up the rest of the story.So sweet.She loved him well. (a favorite memory would be looking through the giant JC Penney catalog to get ideas for what we might want for Christmas. Also, the meals! For sure her cooking. Trav also mentioned remembering sitting in Mammaw’s lap and her reading to him. Thursday afternoon we were looking at some pictures and we came across a picture of several of the grandchildren sitting in Mammaw’s lap and she was reading to them. The expression on her face was one of absolute contentment and joy. Bro. Billy Carter officiated the service and his first comments were about how much better our world would be if we lived our lives as content as Edna Ferry lived hers. If we loved and cared for those around us the way she did, if we all felt blessed by God for the things we have, and if we lived our lives with a servant’s heart - our world would truly be a better place. 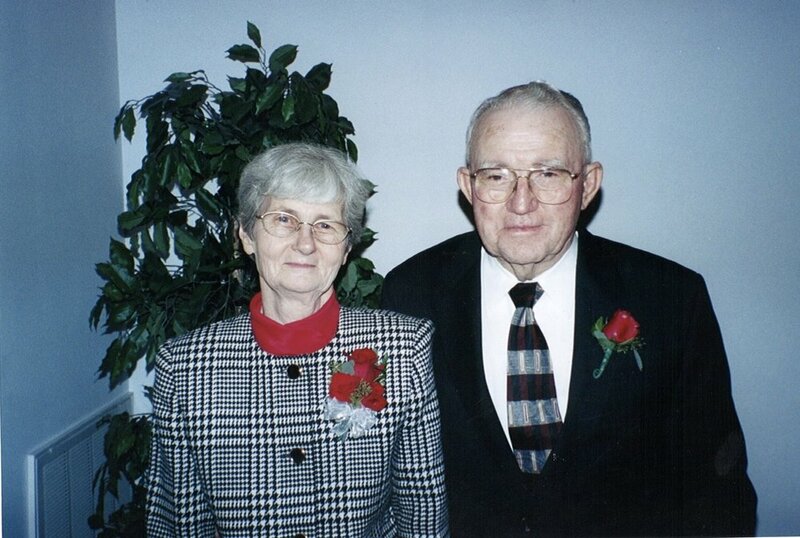 Mark’s grandparents touched the lives of many, including my own. I am a better person having known them. I am in awe of the legacy they have left behind to their family, friends, neighbors, and community. My heart’s desire is to continue their legacy in the way I love others, the way I love Mark and our children, and to pass on to our grandchildren someday. Thank you for allowing me to share today. I hope their story touches your life as well. 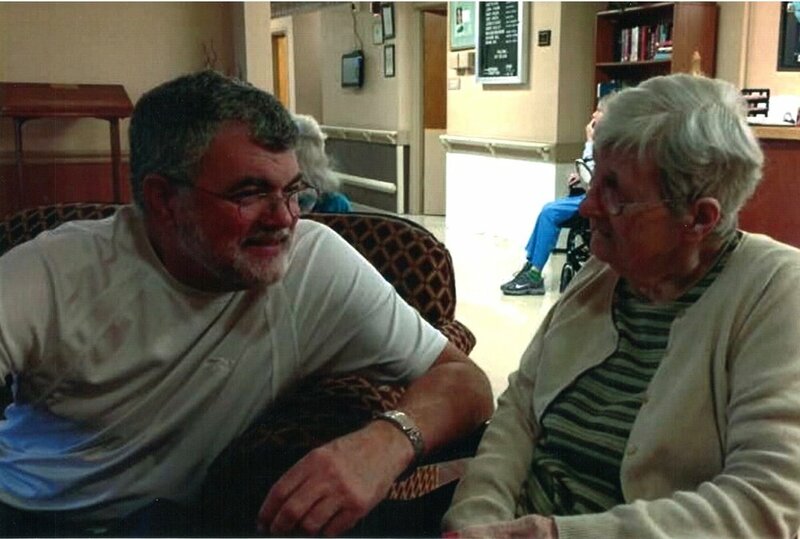 And thank you to my father-in-law, Mike, for allowing me to share some of his heartfelt words about his mom. She will forever be cherished in our hearts. 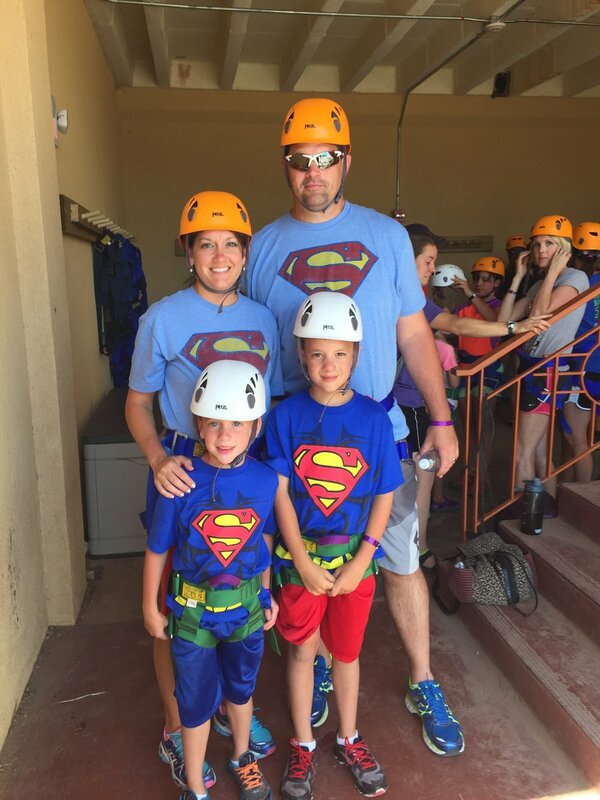 Last week, I shared a little on Tuesday Talk about how our favorite family vacation to date was when we went to Family Camp in Glorieta, NM. This was us on Super Hero day! We did lots of activities that week! But the BIGGEST BLESSING of our week, was spending time studying God's word together. Each morning, we had a worship time with all the families where we would start our day singing songs of praise. We would then break into small groups - adults, youth, and children broken up by ages/grades. We each studied the same lesson each day but it was taught on each level. We had a speaker for the week that shared the lesson with the adults and then camp counselors taught the lesson and led discussion with the kids. Next, was family time. Each family found a place to meet and further discuss the day's lesson with one another and complete an assigned activity. 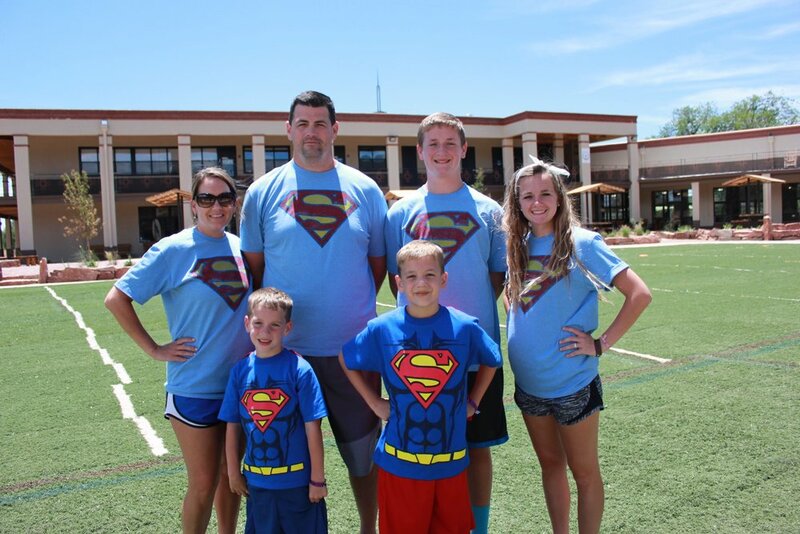 It was wonderful to have this time with our kids and to really listen to what was on their hearts! We wanted to come home and remember that God is always with us and He is always working around us. Don't Miss the opportunities God gives you each day. Don't Miss the chance to be kind. To be nice to others. To lift each other up. Don't Miss the opportunity to share God's love. To tell others about Him. Don't Miss the opportunity to praise God. To see God in everything around you. To lift your voice in song to glorify Him. We decided to hang it above the door to our garage. This is the door we come in and out of 20 million times a day. When we discussed as a family where to hang our sign in our home, this was the place we all agreed. We wanted to see this reminder every day as we left our home and went out into the world. My prayer for you this week is that you Don't Miss It. We had crazy freezing temperatures here in Texas on Saturday. Thankfully, they canceled soccer and baseball and so we had the day to get all the things done on our "To Do" list! Well, a lot of things anyway. It was a much needed day at home! We attended church on Sunday morning, had Cutter's soccer game Sunday afternoon, a meeting at church, and then the annual Pie Auction at church that evening which is a fundraiser for our youth. Today, I wanted to share about my Daily Quiet Time. My favorite way to start my day is with my daily quiet time. My morning routine is to wake up, wash my face, brush my teeth, grab a cup of coffee, and have my quiet time. Now please know that for many years while my kiddos were little and my sleep was interrupted with babies and toddlers, I squeezed in my quiet time whenever I could throughout my day. When I taught, it was during my break. However, now that my kiddos are older and my sleep schedule is more consistent, I MUCH prefer mornings! I have always been a morning person. I just LOVE the quiet stillness of the morning hours. 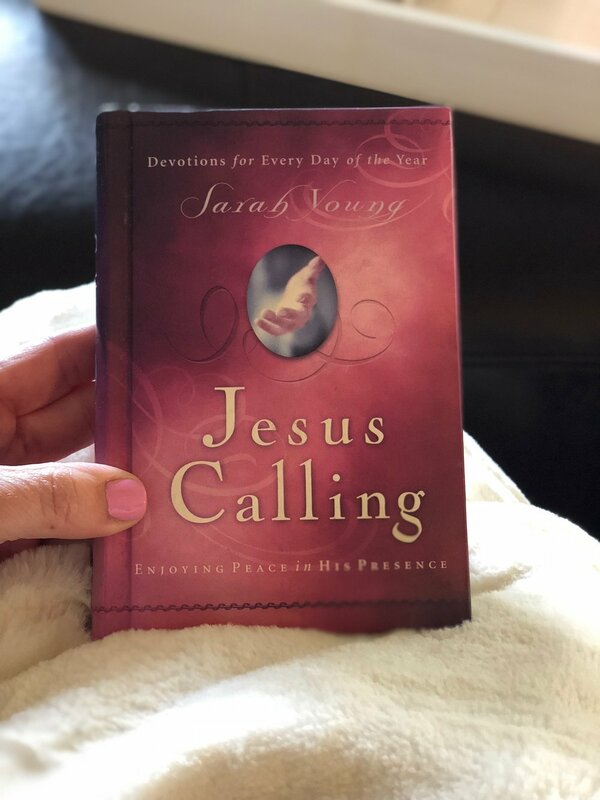 I start with reading Jesus Calling by Sarah Young. Each day has a short reading and then some scripture references. It is always a good thought for my day. Next, I read my One Year Bible. Mark gave me this Bible for Christmas in 2016 and I LOVE it! I read it in 2017 and am now repeating it in 2018. No matter how much or how often I read scripture, God is always faithful to reveal something new to me. Things I didn't dwell on the first time or details I missed before will jump off the page. I am constantly growing in my faith and in my walk with the Lord. My One Year Bible is written in the New Living Translation. The format is broken into daily readings as well. There is a passage from the Old Testament, New Testament, Psalm and Proverbs for each day. The passages are written in order of the books of the Bible. For example, your Old Testament reading will be in Genesis each day until you read all of Genesis, then it will go to Exodus - New Testament starts with Matthew, then Mark and so on. You read through the Psalms in order and then Proverbs in order as well. I really like the format! It has been the easiest for me to follow when reading all the way through the Bible. You can find the One Year Bible on Amazon HERE. After my daily readings, I spend time in prayer. Praying over my day, my kids, Mark, my family, my clients, friends, and any other prayer concerns for that day. I am a HUGE believer in the power of prayer. 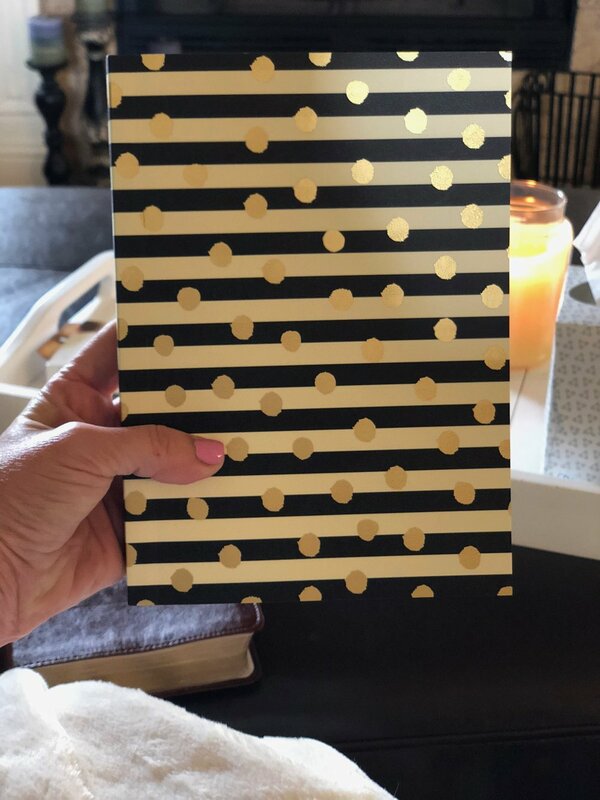 I keep a prayer journal to remind me of prayer requests mentioned at church or from family and friends as well as what God has laid on my heart to be praying for during that day or season of life. Right now I am using this journal. It is just one I picked up at Target. I write the date and then what I am praying for/over that day. I also write praises in my journal. I believe a big part of our time spent in prayer with God should also be spent praising Him for all He does for us and the many blessings we receive daily. I also like to note what I am grateful for in my prayer journal. I try to jot down a couple things each day and try not to repeat - from little things like grateful for coffee to big things like health and Mark & the kids. 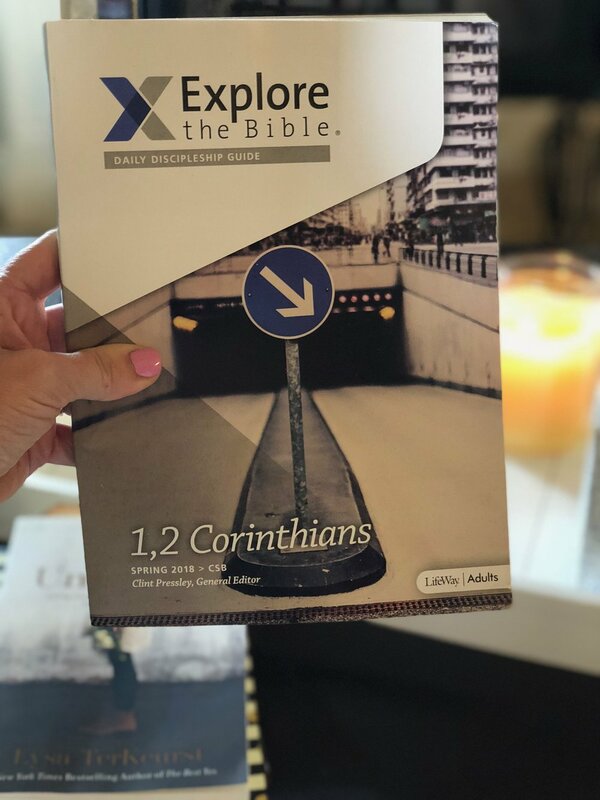 Our Sunday School class is trying out a new Discipleship Study Guide format this spring and so far I am a FAN! This study guide is broken into 5 daily readings over what the lesson will be the following Sunday. I feel like it really helps me to be prepared for lesson on Sunday and gain more from our Sunday School teachers and class discussion if I have already read over/studied the material beforehand. Again, this is a very short reading each day. Last, I end my quiet time with reading a chapter of a book. If you know me, you know I LOVE LOVE LOVE to read! If I could find a job where someone paid me to read books, I would apply immediately! If you know of such a job, PLEASE share! Ha! Because I am always trying to find more time to read, I recently started reading a chapter during my quiet of a Christian genre book. Right now, I am reading Uninvited by Lysa TerKeurst. That's how I do my quiet time. What about you? I'd love to hear if you have any books/devotions/studies you recommend and how you have your daily quiet time! I'm linking up with the Hello Monday girls today! Seven years ago today, my Dad lost his battle to cancer. It is so hard to think it has already been 7 years of events and memories he has missed. My heart breaks that my older children barely remember Papa David and our younger kiddos will never know him. They were only 3 yrs old and 1 yr old when he passed away. Before Dad died, he left a gift for each of us four kids with instructions not to open until after he passed away. December 7, 2010, I opened that box. It was a wind-chime with the engraving "Love you Tish, Dad". It had a poem with it titled "Whispers From Heaven". That wind-chime hangs on my back patio. I sit in the still and quiet and listen to the gentle breeze play the chimes. I love you Dad. Miss you EVERY. SINGLE. DAY. Praying for all of you who have lost loved ones this holiday season.